I just finished sewing the zipper into Roam. Progress ... yay! After the great moth massacre delayed any finishing work this weekend, I had just about convinced myself to bring the sweater and zipper to a seamstress. Then I had a little free time today and wanted to give it a try. This page helped me. I didn't even follow the directions to the letter, but reading the tutorial took the mystery out of the process and made it seem doable. I departed from the instructions when I pinned the zipper to the I-cord. You are supposed to pin the zipper on the wrong side of the sweater, and then try it on before you sew it in. I tried that first but it didn't look quite right. I ended up pinning the sweater to the zipper while looking at it right-side-out, so I could see how it would look as I went along. Pinning it that way also removed the need to baste the zipper in. Instead I went straight to sewing it in without removing the pins. I'm sure there is a reason for doing it the other way but this worked for me. I am happy with the end result and happy to be moving on! A week or so ago, I walked into our spare room where I store my yarn and saw a little moth flying around. I worried it was a wool-eating moth, but after tossing some of my stash around and not finding any other evidence of moths, I stopped worrying. I was in denial. Such a pleasant place to be, a place I was rudely yanked out of yesterday, when I picked up some sock yarn and a moth flew straight out of the skein I had just turned over. At the moment, I consider myself to be very, very lucky. For one thing I have a stash of yarn to care for. That in itself is a luxury I am grateful for. Secondly, every bit of yarn I own has now passed through my hands on it's way into a freezer bag, and I only found 3 skeins that show any signs of damage. I'm not taking any chances though. I read up on the subject here and here and decided the freezer and the vacuum cleaner are my best pals this weekend. I may have happened upon the ultimate reason to keep one's stash under control. Perhaps this was a blessing in disguise. After all, I've been meaning to cull the herd for some time now. I've learned two things about myself while going through my stash. 1) I like to buy red yarn. 2) My taste has changed since I first learned to knit. I've already gotten rid of some, and more will be gone after a visit to the freezer (just to be certain I'm not passing on a gift that keeps on giving). 1) There is always Ravelry. If you get your stash listed, you can put it up for trade/sale. 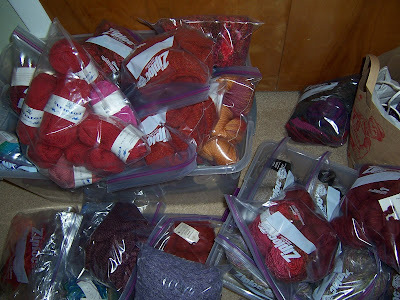 There are also Ravelry groups that exist just for destashing/swapping. 2) Stitches from the Heart is an organization that takes donations of knit items to give to premature babies in hospitals. They also take donations of yarn and supplies to pass on to seniors who are on a fixed income, who want to knit for the babies. 3) Check your local elementary school. Sometime they will take yarn for knitting or other craft projects. 4) Scrap takes donations of reusable materials and makes them available to artists, teachers and other community groups. I enjoy knitting. I enjoy knitting so much that I finally understand why people put those bumper stickers on their cars, you know the ones that say "I'd rather be (insert hobby here)". In the past, if I saw one of those bumper stickers, and if I thought about it at all, I may have thought something like "Wow, they must really like golfing, fishing, or some such hobby, a lot to be willing to slap a sticker on their bumper announcing it to the world." But now, I understand. At any particular time I might be driving, cleaning, cooking, gardening, etc. and find myself thinking "I'd rather be knitting!" The last few days have been full of yard work and errands. We've accomplished quite a bit of fall chores like clearing brush and stacking firewood. 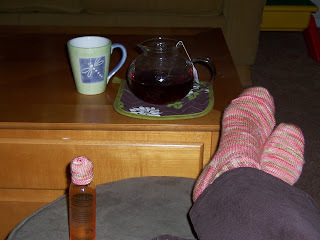 But visions of various knitting projects I would rather be working on were going through my mind. So, to reward myself for my labors, this afternooon I went out and bought a zipper for Roam, and buttons for Loppem, all I need to finish two more projects. The good news is I finished the applied I-cord on Roam last night. I found these photos from the Keyboard Biologist's knitblog to be very helpful. Next I will be trying to learn another new skill: sewing in a zipper. Perhaps tomorrow? The Singing Revolution update: my knitting group's movie night had to be rescheduled so I still haven't viewed the documentary myself. However, I was very excited to see that a few people have added comments to the discussion thread on Ravelry, AND that it was mentioned by Ann on the Mason-Dixon Knitting blog. Woo-hoo! Thanks, Ann! I love a film festival, but it's not a pleasure I indulge in often enough. Now, thanks to Ann Shayne over at Mason-Dixon Knitting, I get to attend one just sitting on the couch (or Angie's couch as the case may be). I can't wait to watch the movie The Singing Revolution and join in the discussion. As you can read here, the movie package, which is winding its way by mail through a list of other Mason-Dixon fans out there, includes not only the movie but also a notebook for viewers to share their comments. Even though I chose not to get on the mailing list (as I didn't want my frequent lack of promptness in such matters to hold up the line), I was feeling a pang that I wouldn't be reading and adding to the commentary. I emailed Ann to see if there was an alternative. She graciously replied and suggested that we start a discussion thread at the Estonian Knitting Group on Ravelry. I started the thread this morning and will go back and add to it after watching the movie. Whether you are on the movie mailing list, or you are getting the movie from the library or Netflix, or maybe you are even buying your own copy, wouldn't it be great to have a group discussion? If you agree, please come on over here and add your thoughts about the movie. No more progress on Roam since Saturday. But as the seams were finished that night, I was able to try it on. It is about 4 inches longer than it is supposed to be. That is how much it stretched with washing. I was actually tempted to get it wet again and throw it in the dryer. If I start considering that again I may have to call a friend to talk me down. I stopped myself because I will get some wear out of it if I leave it as is. But if I put it in the dryer, something really wonky might happen. It's long, but I always thought it would be just a casual sweater. But if I am going to do anything to try to shorten it, I should do it prior to adding the I-cord and zipper. Any advice? Meanwhile, the whole family was free on Sunday so we put the dogs and fishing gear in the car and headed up to a creek near Lassen National Park. Riding in the car, I was able to continue far enough on my Jaywalker Socks (link to free pattern on Ravelry) to see the pattern emerging in the Lorna's Laces. While knitting I did notice an error I had made earlier. About halfway up that middle column of paired increases, one of the increases is one stitch over too far the right. Hmm, how about this blogging thing? And see that loose tangled yarn? Back at home, while unloading the car, I made it down the driveway, through the garage, and across the back porch with the sock in one hand and the ball of yarn still back in the car. Luckily, my son noticed and stopped me before the yarn was completely ruined. Oh well, fresh trout for dinner, and car knitting. All in all a pretty good Sunday. 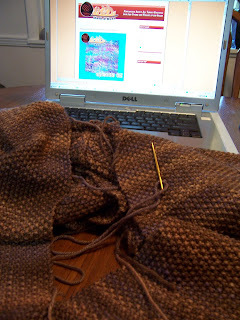 I started this blog exactly one week ago with a goal of getting down to seaming. It's taken time to prep my first project but actually the timing couldn't be better! 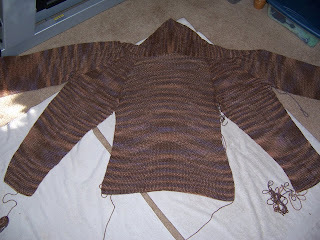 Roam is all dry and ready for seaming on the same evening that I have the time to work on it. My husband is at work, our son is at a birthday party, the dogs are walked, the chickens are fed and the eggs are collected, and I've had my caffeine. Roam is knit completely in seed stitch and I did not add any selvedge stitches. So I did spend time looking online for any specific instructions about seaming seed stitch. I couldn't find any so I decided to stick with mattress stitch. The first side seam is done, so I know the other seams will go quickly. I explained earlier that one of the things I hope to get out of finishing 7 sweaters all in a row, is a bit of an attitude adjustment toward finishing. So far, so good. Seaming, especially mattress stitch is really not bad once you get going. I am helping myself out by having something entertaining going while I sew. That icon on my computer screen is the logo for the Stash & Burn podcast. Nicole & Jenny are knitters who have also been podcasting for a few years. I'm late to the podcasting party, but I still thought I would share the link. They add links on their home page whenever they discuss a pattern, a book, a yarn, or a designer, etc. That way, it is kind of like looking at Ravelry links, while hearing a little more detail about each item from 2 friendly tour guides. Also, I get to learn a new skill while finishing Roam: applied I-cord. Learning something new is one of my favorite things about knitting. 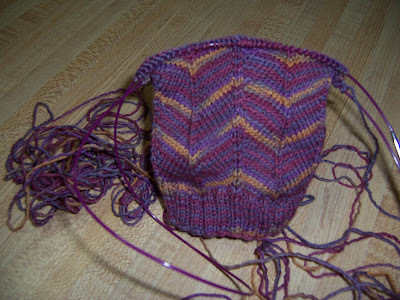 Now back to seaming, more about that tomorrow. It is almost dry and ready for seaming, but not quite, so I don't have any actual progress to report. The process of finishing, and what I am learning from it, is still on my mind while I wait. I knew I wanted to knit this pattern by Laura Chau the minute I saw it in Knitty. And I fell in love with the yarn right away when I saw it at the Brooks Farm booth at Stitches West. So, why is it that, while I still think Roam is a great pattern, and I still love the yarn, I am at that stage where I am not so sure I am going to like my finished item in said yarn. It currently looks like a deformed starfish, because in this pattern you have to complete the raglan seams while you still have live stitches at the top of the sleeves and the body of the sweater. Only then do you pick up and knit the hood stitches. Because of this, it made sense to me at the time to keep knitting instead of washing and blocking. However, I still wanted to block it before sewing the sleeve and side seams. The result was a large, heavy, and amorphous piece of fabric that was difficult to towel dry and lay out into the correct shape. Lesson #1: Block pieces before seaming. Okay, this isn't anything new. But it's taken me awhile to learn it and, like a rebellious teenager, sometimes learning from my own mistakes is the only way I will follow these types of instructions. It would have been much easier to measure and pin separate pieces of the sweater and I probably would have been happier with the outcome. I may even start blocking pieces as I knit them, which leads to my second issue. Lesson #2: Swatching. Not only is this not anything new, I feel like I'm beating a dead horse. But I'm going to say it anyway so feel free to stop reading here. At that same Stitches convention, a friend and I took a great class from Leslye Solomon, who showed us many swatches before and after washing. It was a very effective demonstration, as there were large differences between the before and after swatches. So before beginning Roam, I dutifully knit a swatch and I even washed and blocked the swatch. But I was impatient and I only knit a couple of inches. (I was excited. I knit the swatch in the hotel room at Stitches West immediately after buying yarn from the very nice people from Brooks Farm.) Therefore as I was knitting Roam, I was expecting, and trying to account for, some stretching of the fabric after washing. But clearly, the couple of inches I impatiently knitted for my swatch wasn't enough to inform me just how much the fabric would stretch once the weight of the full sweater affected the drape of the fabric. I think it could end up being much too long. Will I still finish it? Yes. Will I still wear it? Probably. Will I do it differently next time? So, my current WIP, Roam, is being blocked and is on it's way to being finished. However, it is still drying, and I can't get much seaming done while it is wet, can I? So I can just knit today, without falling off the finishing wagon. But I wanted to work on a small project, so that I don't get too far off track. In fact, the project I am working on is very, very small. Here is my first hat for the big knit 2009. Last year the Innocent drink company received over half a million of these little hats. The money raised by the project will go to help keep older people healthy this winter. The website includes patterns which are a great use for leftover sock yarn. What could provide more instant knitting satisfaction than completing an entire project from start to finish while drinking a single cup of tea? So, years ago, while I was taking a sweater knitting class, the teacher told us a funny thing. 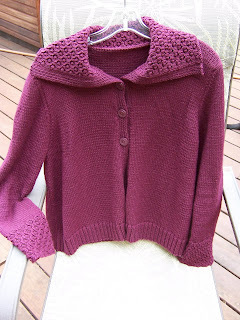 It was a tidbit she shared with us that she knew many sweater knitters who never finished anything. To them knitting was just that. To them it was all about buying yarn and knitting something up, only to move on to the next project. Hence, they had pieces of sweaters tucked away that they had no intention of finishing. At the time, I thought this was, well, just a little crazy. Why, oh why, would someone take all that time to knit an entire sweater, and never take those last steps so that they could wear it? Well, now I know better. I understand the lure of casting on for a new project, rather than blocking and seaming the old one. I understand that I can easily continue performing the knit stitch in a variety of situations: talking with friends over martinis, flopped on the couch watching a movie late at night, and even while stopped at a red light. On the other hand, washing, blocking and seaming require a highly unavailable (at least in my house) combination of factors: a clean flat surface and some quiet, uninterrupted time in which to concentrate. 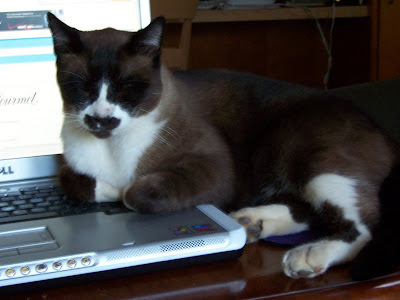 In fact, I paused in writing this post just now because my son was showing me how he can do a handstand, and one of our cats was sitting on the mouse-pad, shedding on the computer and drooling on my hand. It's a happy-enough state of affairs, but not one I find conducive to finishing sweaters. I'm not sure what happened in 2008. 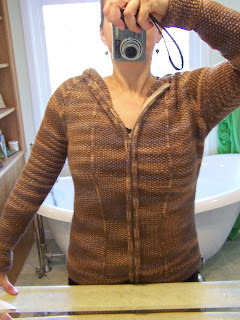 I must have knit only items without set-in sleeves. Anyway, my plan is to work my way back up the list, starting with the most recent item, and clear them from my queue one way or another. To show my determination, I've included the photo above of my most recent FO, Assemblage. I cast on for this sweater this past June, and finished it last week. I'm counting it as the first finished item checked off in my new plan. Do you think I can get through my list in time for Stitches West 2010? It goes without saying that I've been motivated to join the blogging community by my love of knitting. I've been at it since 2004, after receiving yarn and needles for my birthday. Once I got it down I was completely addicted. Knitting has provided me with opportunities to learn new skills, to be inspired, to have a creative outlet, and to connect with others who share the same passion, all the while creating hand-made gifts and clothing. I am a former school librarian but my focus for now is my family and our mini-farm. I am fortunate to have a husband and son who put up with my stash and my obsession with my WIPs. 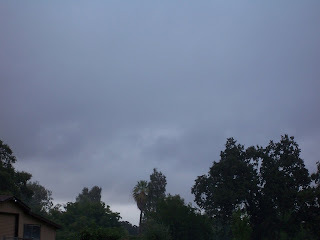 We stay busy here in N. California tending to our garden, our fruit trees, and our menagerie of 1 sheep, 2 dogs, 3 cats, and a flock of chickens. Next up: my most recent finished object!